sQuad, Software parametric EQ from PSP Audioware. 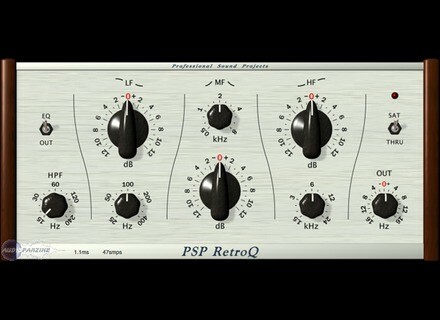 PSPaudioware has announced the release of PSP sQuad, a bundle of four new high-quality equalizer plug-ins: PSP ClassicQ, PSP ConsoleQ, PSP preQursor and PSP RetroQ. PSP has added to its EQ several features including variable high pass filters or switchable steepness for the shelving filters. These EQs are said to be CPU efficient enough to be used at every stage of the creative process, from composition to tracking to final production/mixing/mastering. FAT double sampling. In the PSP sQuad bundle, unlike other PSP Audioware plug-ins, FAT is automatically switched on for low (below 50kHz) sample rates, and off for higher sample rates. 64-bit double precision floating point computations for "ultra low accumulative errors in the filters." An optional second generation SAT(uration) option in the output of each plug-in. This both protects against digital clipping in software or hardware following the plug-in, and adds a smooth, overdriven sound to hard-driven signals, according to PSP. The SATuration algorithm is located after output level control in a plug-in's internal chain and its ceiling reference level is setup a fraction of dB below 0dBFS. All actual parameters like gain, frequency or Q may differ from displayed values which is a typical feature of analog equalizers. PSP ClassicQ is inspired by various classic British-style equalizers. It captures the sound and flavor of famously musical high and low filters (such as those in early Neve EQs), melded to mid-range filter. In addition, PSP ClassicQ offers a selectable simulation of class A circuitry and output transformer for a "unique, vintage-style color." To its classic features PSP ClassicQ adds features such as an adjustable high pass filter, switchable Q for low- and high-shelf filters, and a sweepable midrange bell-type filter. PSP ConsoleQ has an adjustable high pass filter, steepness (resonance) control for the shelving filters, and three nominal Q values for midrange filters. In addition to its other musical features PSP designed PSP ConsoleQ's midrange bell type filters so that they have gain following Q factors. By this, PSP means that the Q factor of these filters gradually increases along with increases in boost or attenuation. The ConsoleQ is designed for deep track tweaking to get the desired sound for a track, or just to get great track separation in the mix. PSP preQursor is said to have filters with low resonance peaks for reduced ringing artifacts, great band separation, and narrow notching on negative gains. All four filters are bell-type filters with progressive Q factors. PSP RetroQ is described as optimized for use on groups and mixes, but is said to be "equally at home in any situation in which you desire some gentle sweetening in your overall processing chain." The PSP sQuad plug-in bundle is available for Windows and Mac OS X in VST, AU and RTAS formats. The bundle has an MSRP of $249 but is available for the introductory price of $199 until February 14th, 2009. 14 day demo versions are available for download. A version 1.1.1 update, fixing a number of issues, is already available for registered users. New Christian Budde Free Plug-Ins Christian Budde has released several new free VST effect plug-ins for Windows. Speakerphone For Windows Update Audio Ease has updated the Windows version of Speakerphone to v1.1.1. Waves Dorrough Meter Collection — Surround Edition Waves has announced the availability of the Dorrough Meter Collection — Surround Edition, which includes the entire Waves Dorrough Meter Collection with its display features and functions, plus customized meters engineered for surround production environments.